It is nice to see that i am earning money online through my blogs but i thought i'm over doing it. It's true that i am too busy with my work and school but i used to have time to update my blogs and do some blog hopping once in awhile. But everything changes after i become active in blog advertising. I realized that i am paying too much attention to it and i lost the real purpose of blogging. I forgot that blogging is more than blog advertising and it seems that sponsored posts are dominating my blog more than my personal entries. 2008 is my most active year in blogging where in i'm updating my blogs regularly and sticking only into one central theme. I'm actively participating in some tags and meme which is fun, i do my blog hopping routine more often. Just like you guys, i am looking for that "bluedreamer" who is an active blogger way back 2008. That is what i am targeting right now. I am not saying that i will stop participating in blog advertising but i will minimize my obsession to it and will pay more attention to my blogs. It's been years now, but i'm still here in the blogosphere. I've seen a lot of my friends went to hiatus and never went back. It's like, a batch of bloggers went out then another batch will came in. I prepared a lot of exciting events for my blogs. Here, i made a slideshow for them. These are the things you should watch out this year from me. I'll give you an update when will these portions start. Here's another Top Five Entry for you guys. "NICOLE KIDMAN AND KEITH URBAN"
Kidman ane Keith Urban met at G'Day LA, an event honouring Australians in January 2005. They married on 25 June 2006, at Cardinal Cerretti Memorial Chapel in the grounds of St Patrick's Estate, Manly in Sydney. They maintain homes in Sydney, Sutton Forest, Los Angeles and Nashville, Tennessee. In March 2008, they bought mansions in Los Angeles and Nashville within days. After speculation by the press, it was confirmed on 8 January 2008 that Kidman was three months pregnant. The couple had their first child, Sunday Rose Kidman Urban, on 7 July 2008, in Nashville, Tennessee. They are not actors in Hollywood but they are certified celebrity knowing that they are in every pages and covers of every Magazines. Obama met Michelle Robinson when he was employed as a summer associate at the Chicago law firm of Sidley Austin. Assigned for three months as Obama's adviser at the firm, Michelle joined him at group social functions, but declined his initial requests to date. They began dating later that summer, became engaged in 1991, and were married on October 3, 1992. The couple's first daughter, Malia Ann, was born on July 4, 1998, followed by a second daughter, Natasha ("Sasha"), on June 10, 2001. The Obama daughters attended the private University of Chicago Laboratory Schools. When they moved to Washington, D.C., in January 2009, the girls started at the private Sidwell Friends School. "BEYONCE KNOWLES AND JAY Z"
On April 4, 2008, Knowles and Jay-Z were married in New York City. It became a matter of public record on April 22, 2008, but Knowles did not publicly debut her wedding ring until the Fashion Rocks concert on September 5, 2008 in New York City. Knowles finally revealed their marriage through an opening montage video at the listening party for I Am... Sasha Fierce in Manhattan's Sony Club. Victoria Adams started dating football player David Beckham in 1997 after they had met at a charity football match, prompting him to request a meeting with her. Of their initial meeting she said, "I didn't really know who he was. I was never into football." The couple announced their engagement in 1998 and were dubbed "Posh and Becks" by the media. On 4 July 1999 they were married by the Bishop of Cork, William Paul Colton, at Luttrellstown Castle, Ireland. The wedding attracted much media coverage. David Beckham's team-mate, Gary Neville, was the best man, and the couple's four month old infant son Brooklyn was the ring bearer. Most of the media were kept away from the ceremony as an exclusive deal with OK! Magazine had been arranged, but photographs were released showing the Beckhams sitting on golden thrones. A total of 437 staff were employed for the wedding reception, which was estimated to have cost £500,000. The couple bought what would become their most famous home for £2.5 million in 1999; the property, which is set in 24 acres (97,000 m2) of land, was duly given a £3 million renovation and was subsequently dubbed Beckingham Palace by the media. The couple have three children, Brooklyn Joseph Beckham (born 4 March 1999 in London), Romeo James Beckham (born 1 September 2002 in London), and Cruz David Beckham (born 20 February 2005 in Madrid, Spain). "BRAD PITT AND ANGELINA JOLIE"
In April 2005, one month after Aniston filed for divorce, a set of paparazzi photographs emerged showing Pitt, Jolie and her son Maddox at a beach in Kenya, which appeared to confirm the rumors of a relationship between Pitt and Jolie. During the summer, the two were seen together with increasing frequency, and the entertainment media dubbed the couple "Brangelina". Pitt and Aniston's final divorce documents were granted by the Los Angeles Superior Court on October 2, 2005, officially ending their marriage. On January 11, 2006, Jolie confirmed to People that she was pregnant with Pitt's child and thereby confirmed their relationship for the first time in public. In an October 2006 interview with Esquire, Pitt said that he and Jolie would marry "when everyone else in the country who wants to be married is legally able". Following months of media speculation, Jolie, in an interview at the 2008 Cannes Film Festival, confirmed she was expecting twins. On July 12, 2008, Jolie gave birth to the couple's twins, a boy named Knox Léon and a girl named Vivienne Marcheline at the Lenval hospital in Nice, France. ○ Taylor Lautner as "Max Steel"
○ What Browsers Should You Use? ○ Sleeping With Wet Hair can cause Blindness? Within my two years of blogging, we've been in so many places and discovered some wonderful things to know about them like South Korea, Turkey, Australia, Brazil, Canada, Dubai, Hawaii, New York, Philippines and Thailand. And now, we'll be doing an island hopping as we discover the wonderful place offered by the "Caribbean" Despite of what happen in Haiti which is also a part of the Carribean group of islands, let us look forward to a brighter side of this region. "THE STORY BEHIND PIRATES AND TREASURES"
I know that you are all familiar with the "Pirates of The Carribean" but is there really such thing a "Pirates?" 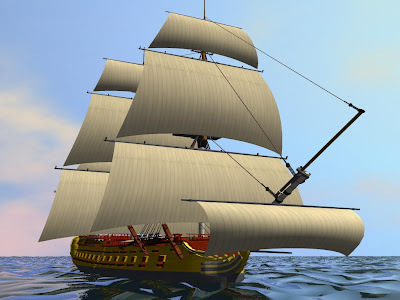 The era of piracy in the Caribbean Sea began in the 16th century and died out in the 1720s after the navies of the nations of Western Europe with colonies in the Caribbean began combating pirates. The period during which pirates were most successful was from the 1690s until the 1720s. Piracy flourished in the Caribbean because of the existence of relatively lawless British seaports such as Port Royal in Jamaica and the French settlement at Tortuga. Caribbean piracy arose out of, and mirrored on a smaller scale, the conflicts over trade and colonization among the rival European powers of the time, including the empires of Britain, Spain, the Netherlands, Portugal and France. Most of these pirates were of English, Dutch and French origin. Because Spain controlled most of the Caribbean, many of the attacked cities and ships belonged to the Spanish Empire and along the East coast of America and the West coast of Africa. Some of the best-known pirate bases were New Providence, in the Bahamas from 1715 to 1725, Tortuga established in the 1640s and Port Royal after 1655. Among the most famous Caribbean pirates are Edward Teach or "Blackbeard", Calico Jack Rackham and Henry Morgan. And about the Pirate buried treasures, although these pirate treasures are favorite literary theme, there are very few documented cases of pirates actually burying treasure, and no documented cases of a historical pirate treasure map. Another case in 1720 involved British Captain Stratton of the Prince Eugene who, after supposedly trading rum with pirates in the Caribbean, buried his gold near the mouth of the Chesapeake Bay. One of his crew, Morgan Miles, turned him in to the authorities, and it is assumed the loot was recovered. In any case, Captain Stratton was not a pirate, and made no map. Chichen Itza is a large pre-Columbian archaeological site built by the Maya civilization located in the northern center of the Yucatán Peninsula, in the Yucatán state, present-day Mexico. Chichen Itza was a major focal point in the northern Maya lowlands from the Late Classic through the Terminal Classic and into the early portion of the Early Postclassic period. The site exhibits a multitude of architectural styles, from what is called “Mexicanized” and reminiscent of styles seen in central Mexico to the Puuc style found among the Puuc Maya of the northern lowlands. The presence of central Mexican styles was once thought to have been representative of direct migration or even conquest from central Mexico, but most contemporary interpretations view the presence of these non-Maya styles more as the result of cultural diffusion. Chichen Itza, a UNESCO World Heritage Site, is the second-most visited of Mexico's archaeological sites. 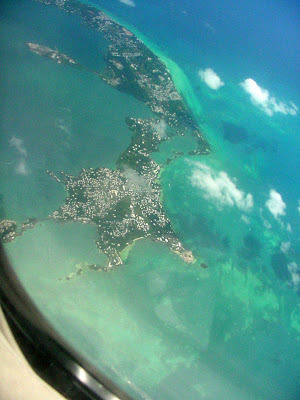 The archaeological site draws many visitors from the popular tourist resort of Cancún, who make a day trip on tour buses. In 2007, Chichen Itza's El Castillo was named one of the New Seven Wonders of the World after a worldwide vote. 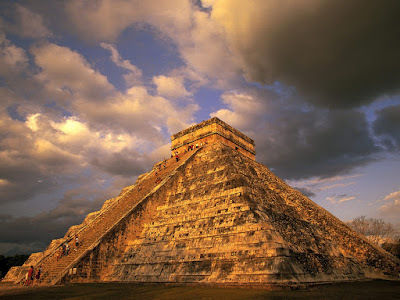 Despite the fact that the vote was sponsored by a commercial enterprise, and that its methodology was criticized, the vote was embraced by government and tourism officials in Mexico who project that as a result of the publicity the number of tourists expected to visit Chichen will double by 2012. The Caribbean islands are classified as one of Conservation International's biodiversity hotspots because they support exceptionally diverse ecosystems, ranging from montane cloud forests to cactus scrublands. The hotspot contains dozens of highly threatened species, ranging from birds, to mammals and reptiles. Popular examples include the Puerto Rican Amazon, two species of solenodon (giant shrews) in Cuba and Haiti, and the Cuban crocodile. The hotspot is also remarkable for the decimation of its fauna. 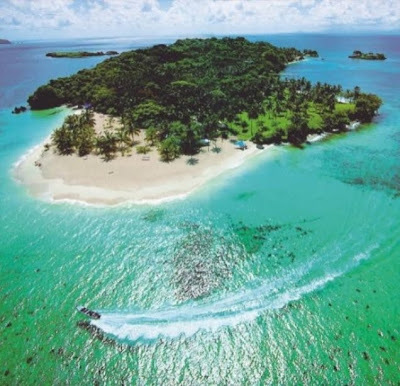 One of the best tourist spot would be the "Saona Island", it is a tropical island located a short distance from the mainland on the south-east tip of the Dominican Republic, near La Altagracia Province. The Island is famous for the natural beauty of its beaches, and has been used on many occasions by film-makers and advertisers looking for a stereotypical 'desert island' setting for their film or product. Dominica's Boiling Lake is situated in the Morne Trois Pitons National Park - Dominica's World Heritage site. It is filled with bubbling greyish-blue water that is usually enveloped in a cloud of vapour. The lake is approximately 200 ft (60 m) across. The first recorded sighting of the lake was in 1870 by Mr. Watt and Dr. Nicholls, two Englishmen working in Dominica at that time. In 1875, Mr. H. Prestoe, a government botanist, and Dr. Nicholls were commissioned to investigate this natural phenomenon. They measured the water temperature and found it to range from 180 to 197 degrees Fahrenheit (82 to 91.5 degrees Celsius) along the edges, but could not measure the temperature at the centre where the lake is actively boiling. They recorded the depth to be greater than 195 ft (59 m). There is no road leading directly to the lake. It is approximately a 13 kilometer hike to the lake from the nearest road, passing sulfur springs, over mountains and through gorges along the way. On July 6, 2007, Adventure film maker George Kourounis became the first person to ever cross the boiling lake from above, suspended by ropes over the most violently boiling section. This event was filmed for the TV series Angry Planet. 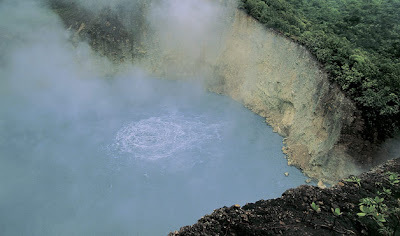 Dominica's Boiling Lake is the second largest hot spring in the world. 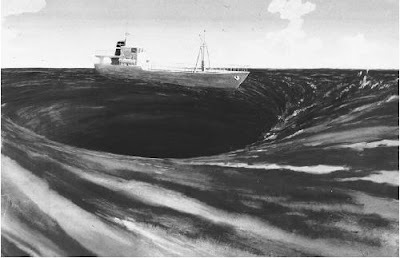 The Bermuda Triangle, also known as the Devil's Triangle, is a region in the western part of the North Atlantic Ocean in which a number of aircraft and surface vessels are alleged to have mysteriously disappeared in a manner that cannot be explained by human error, piracy, equipment failure, or natural disasters. Popular culture has attributed these disappearances to the paranormal, a suspension of the laws of physics, or activity by extraterrestrial beings. While a substantial body of documentation reveals that a significant portion of the allegedly mysterious incidents have been inaccurately reported or embellished by later authors, claims by official agencies, stating that the number and nature of disappearances in the region is similar to that in any other area of ocean, have been directly challenged by the investigations of several private researchers. The boundaries of the triangle cover the Straits of Florida, the Bahamas and the entire Caribbean island area and the Atlantic east to the Azores. Triangle writers have used a number of supernatural concepts to explain the events. One explanation pins the blame on leftover technology from the mythical lost continent of Atlantis. Other writers attribute the events to UFOs. ○ What is "Default Gateway"
Have you ever think of upgrading your car or making a total makeover to it? I remember a Television show entitled “Pimp my Ride”, it is a show where a car undergoes a total makeover and making it more appealing that an owner couldn’t ever imagine. The program crews put some stylish car accessories to help them out redecorating the car. Most car owners are satisfied in having their auto an occasional car wash but for me, it is very advisable to have a car makeover especially if you’re using your care for more than a year. Some car owners consider adding car accessories on their car providing a new look to it. Besides, Car accessories are not just for styling purposes, it also provides protection like car floor mats that protects your car from spills, car window deflectors that provide protection against wind and rain, grill guards for your car frontline protection and more. You can also personalized your car and add a distinctive touch into it by adding car accessories like custom wheels, gauges, GPS system, car spoilers and billet grilles. Your car will show your personality and will measure how creative and responsible you are as an owner!